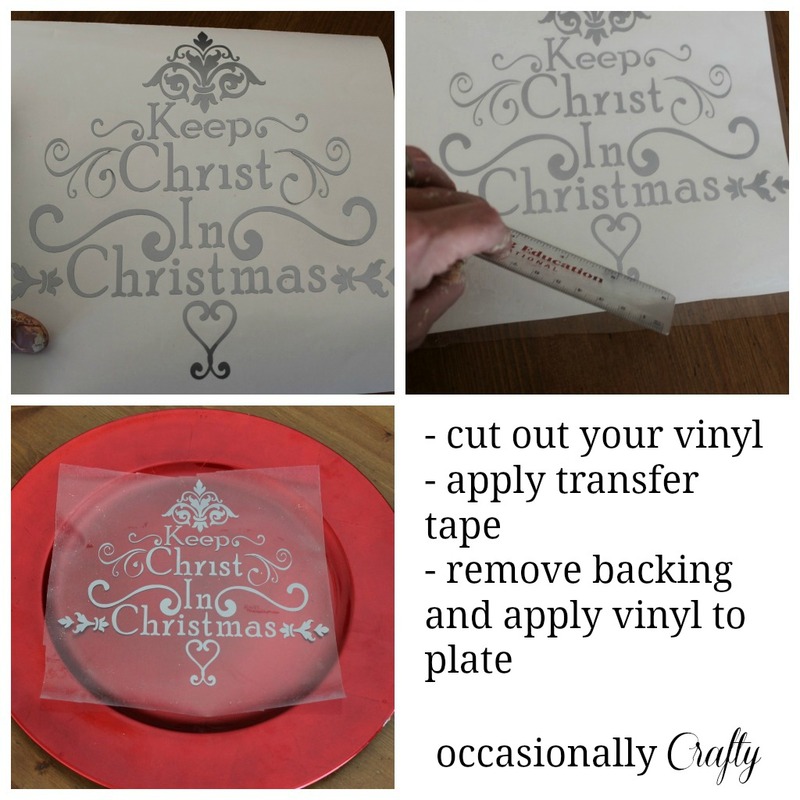 Vinyl Christmas Plate- In Case You Missed It! 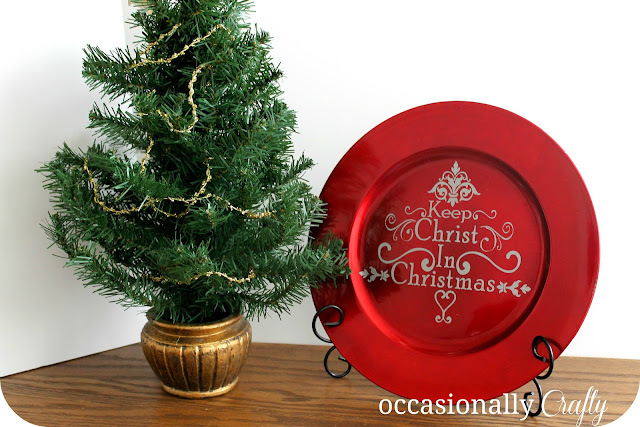 | Occasionally Crafty: Vinyl Christmas Plate- In Case You Missed It! 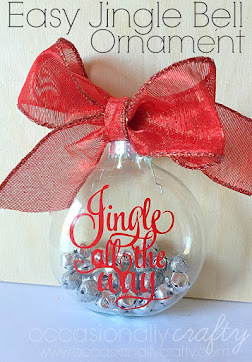 If you've been a reader for awhile, you know that one of my favorite things to use in crafting is vinyl. 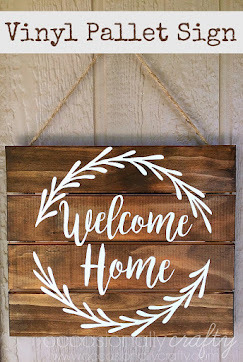 I have a Silhouette Cameo, and I put it to good use making all sorts of vinyl art for my home. 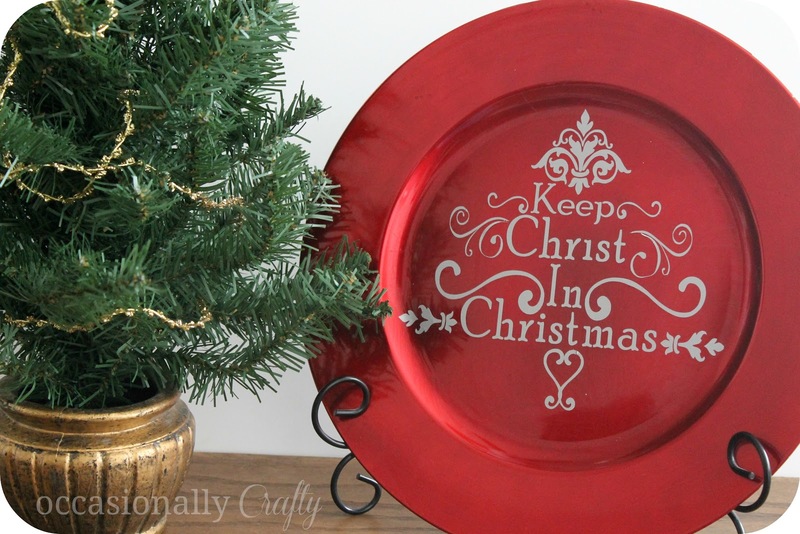 This Christmas season, why not display a plate with a custom vinyl saying on it? There are many out there, I know. However, I designed an image just for you. Before I show it to you, I want to tell you about my inspiration. I LOVE Christmas. As much fun as shopping for and wrapping great presents is, I always try to keep myself and my family grounded, and remember why we celebrate Christmas in the first place. 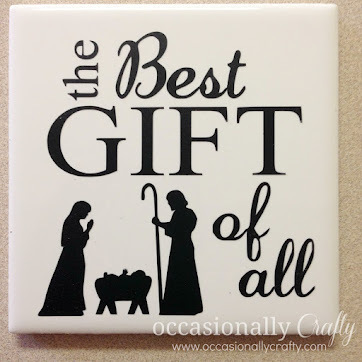 I saw an ornament with the sentiment "Keep Christ in Christmas", and I knew it would be a wonderful thing to display in my home this Christmas. So, if you want to keep a touch of the holy in with the ho-ho-ho, here's a little something just for you. 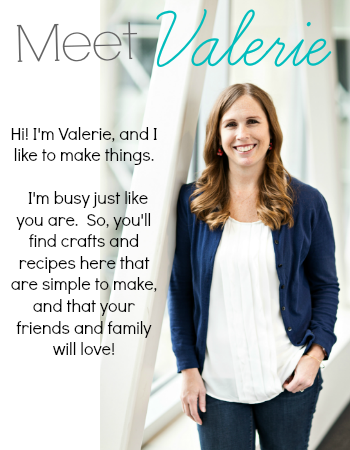 If you have a Silhouette, you can download this file here and open it in your Studio software. You can work with it directly in your new document, or you can click on File, then "Save to Library" so you can keep it as a shape in your library instead of just a document. I sized my shape to fit my plate, then cut it out with my Cameo. Weed the extra vinyl as necessary, apply transfer tape (I use clear contact paper to save money! ), and apply the vinyl to your plate. Remove the transfer tape, and you've got a gorgeous plate to display in your home or give as a gift. If you have any problems downloading the file, let me know and I'll help you out. We're linking this up to some parties this week- come check them out with us! Very pretty! I love the silver vinyl on the red plate! Also, I use contact paper for stencils but never would have thought to use clear contact paper for transfer paper--you're so smart! Thanks for the great tip! Hi Becca- I appreciate you coming over and commenting! Hope your week is great! What a beautiful plate and saying. Thanks for sharing. So pretty! I have a Silhouette but I get so nervous with the vinyl transferring... I have contact paper as well, so maybe I need to give it a try again! Thanks for the tips! So glad you shared this beautiful plate of yours at Wicked Good Wednesdays! I love this! I downloaded Dropbox just for this, but didn't know what program to open it in. I use Sure Cuts A Lot and couldn't get it to open there either. Help! Althea- I'm so sorry but this file is only available in .studio (for the Silhouette). I have no idea create an .svg which is (I think) what SCAL uses. Maybe you have a friend with a Silhouette that could cut it for you?